Buckwheat's Belgium Pale Ale, the beer I brewed Sunday, is the recipe that SheppyBrew Brewery has brewed the most. Sunday's batch was #11, and the second most brewed beer has only been done 7 times. 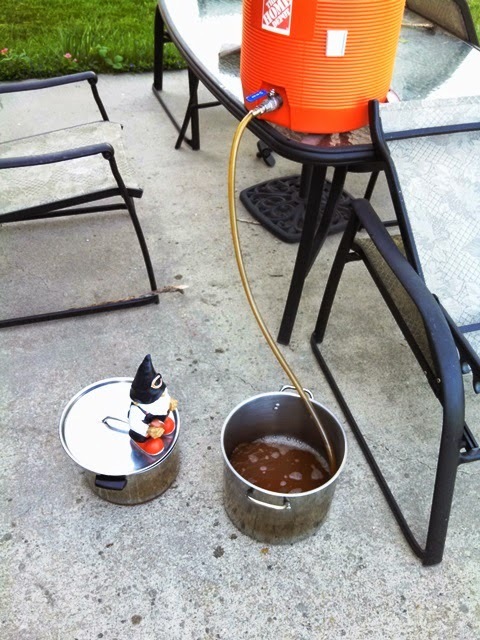 Buckwheat's BPA actually started out an extract recipe brewed in one of my Mr. Beer fermentors. Part of the reason that I've brewed so many batches is that early on I did some experimenting to figure out what yeast was best for this beer. 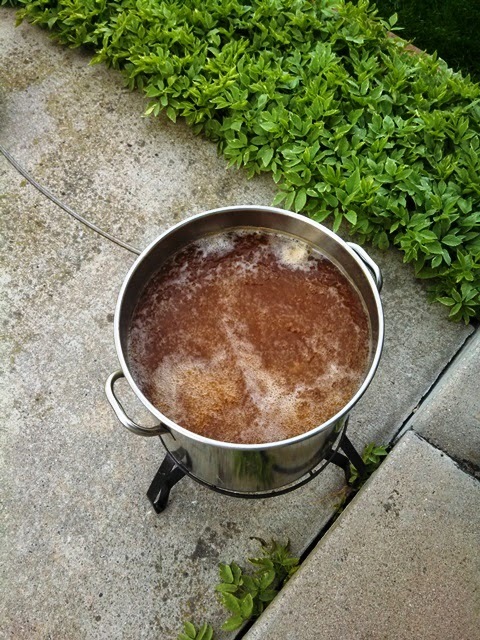 The first time I brewed it was because, the SheppyBrew Beer Model picked out a Belgium Pale Ale recipe from Jamil Zainasheff's and John Palmer's book Brewing Classic Styles. I took that recipe, modified it a little and when it was done, she told me that this was her favorite beer. She said it was not just her favorite of the beers that I made ... but her favorite of all beers. Personally, I think it is weird to have a favorite beer, but that is just me. Because my wife liked it so much, I ended up making it quite a bit. I call it a Belgium BPA, but the yeast, S33, is more of a clean American yeast (also not as clean as US05 or WY1056 or WLP001). 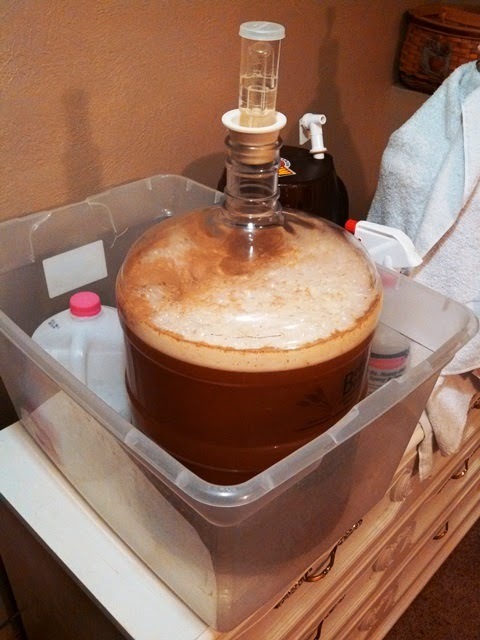 I've experimented with other yeasts, but S33 is what my wife prefers, so that is what I use. 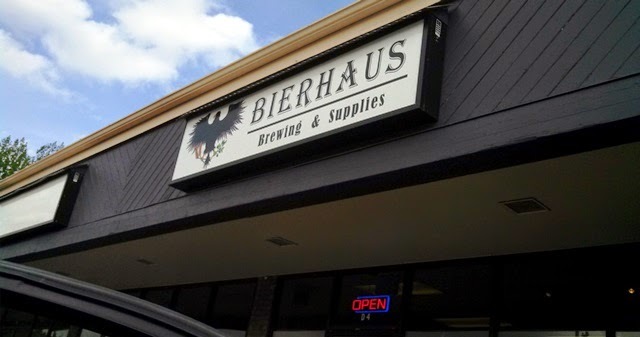 This time for my ingredients, I tried a new homebrew shop in my area, Bierhaus Brewing and Supplies. 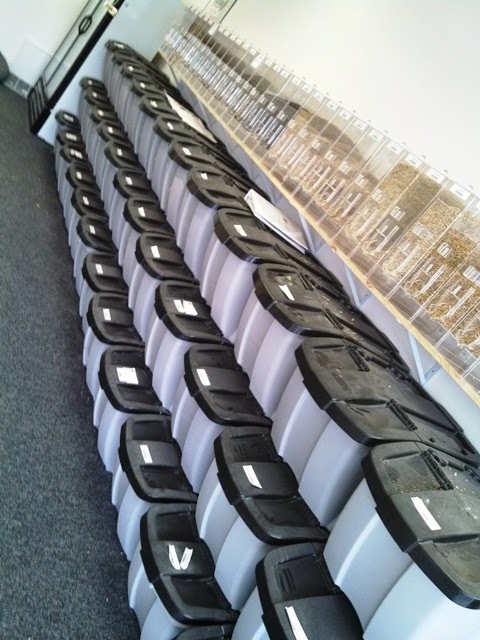 This is my first time buying grains from these guys. This is much closer to my house than any of my other local homebrew shops, so I will probably end up using it quite a bit more. I still like how my usual shop is laid out better, and the selection at this new shop is not quite what it is at my regular, so I still see myself using The Brew Hut, but I am glad to have this closer LHBS for when I was to stop on my way home from work rather than picking up things during lunch at work. Brew day was pretty typical. I actually started the mash after the sun came up, which is a bit unusual for me. Now that we have longer days, though, it will be happening more, I think. I got the mash stabilized right at the desired temperature pretty quickly. I did let the mash go through church, so the whole mash was over 2 and a half hours. My pre-boil gravity was pretty close, but a little low. Not a big deal. The boil went fine. Nothing to report there. 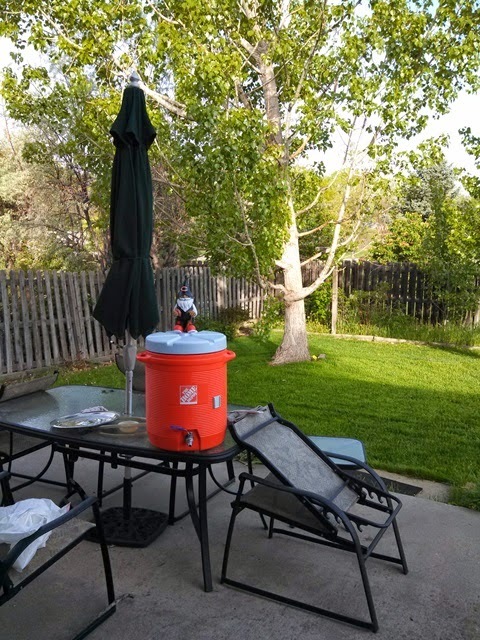 I did use my carboy-in-ice-bath method to cool the wort down to below 60. 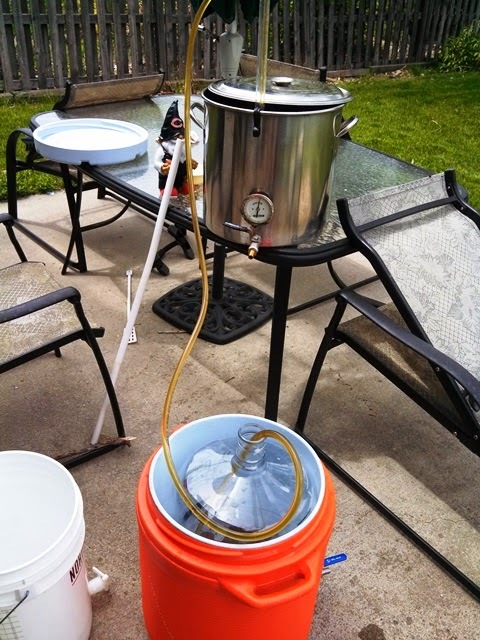 I pitched the yeast and had everything done before the Blackhawks played at 1pm. My OG was 1.053 vs the recipe's planned 1.055, but that is not enough to freak out about. The next morning, the fermentation was going strong. By evening, it was going crazy. By late day 2, it was slowing down already. Currently, it is at 1.015 gravity putting the ABV at just a touch below 5%. I expect the gravity to drop over the next few days by a few points, but of course we will see. There is still a lot of yeast in suspension, which is typical of this yeast and this beer. I'll probably put this in a secondary fermentor to see if that helps clear the beer up a little. So, everything went pretty much as planned and we are well on our way to having another keg of Buckwheat's Belgium Pale Ale. 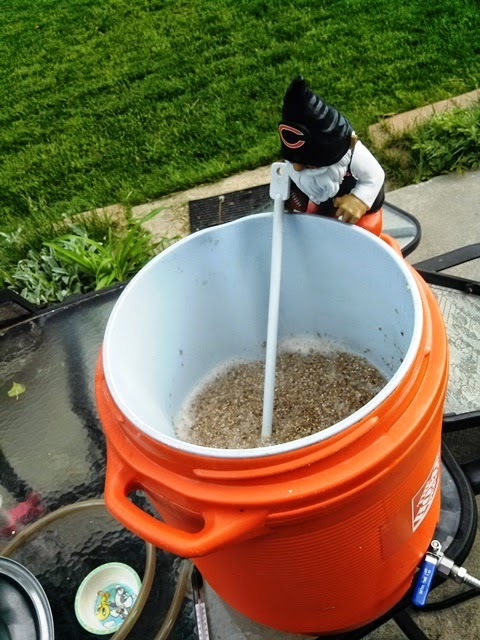 As always, I'll let you know how the finished beer ends up, if not here on this blog, you can always follow my on Twitter, Facebook, or Untappd. And, of course, you can also go look at the comments at the bottom of Buckwheat's BPA page on SheppyBrew.com. Go Blackhawks (they won Sunday, but really got killed in game 2 Wednesday). I just use the frozen water in the milk jug, changing as needed. I tend to only use the ice over the first couple of days. Most of the yeast-derived flavors are generated over the replication phase of the yeast cycle, so temperature control is not nearly as critical after that. My basement is a pretty contant tempature as well, so it isn't like things go crazy after I remove the ice.